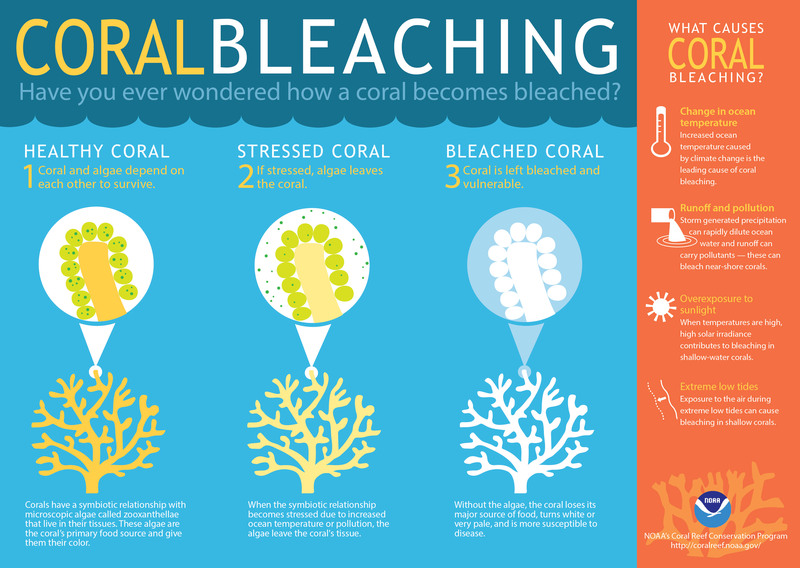 Simply Explained: What is Coral Bleaching and How is it Caused? Coral bleaching–it’s a real concern. But sometimes a lot of the technical jargon can create a barrier for people like me who struggle to understand. That’s why I’ve created this article for you. We’ll chat about what exactly is coral bleaching, how they become bleached, and the very real impact it has on all aspects of life. And I’ll explain it to you in the most simplest way I can. Part 1: What is coral bleaching? Part 2: What are the causes of coral bleaching? Part 3: What mass blacking events have occurred? Part 4: Why is coral bleaching so bad? Part 5: How are coral reefs adapting to bleaching? Part 6: What can be done about coral bleaching? Please include attribution to modestfish.com with this graphic. Coral are marine vertebrates which typically reside in compact, closely-grouped colonies. They are living organisms found rooted to the ocean’s floor like plants attached to soil. Typically, coral polyps are coated with an algae-like substance known as zooxanthellae, responsible for the pale-pink pigmentation of coral. This algae provides 90% of coral’s energy source and is vital for the health of both individual polyps coral and reef as a whole. Zooxanthellae provide coral with nutrients through photosynthesis. 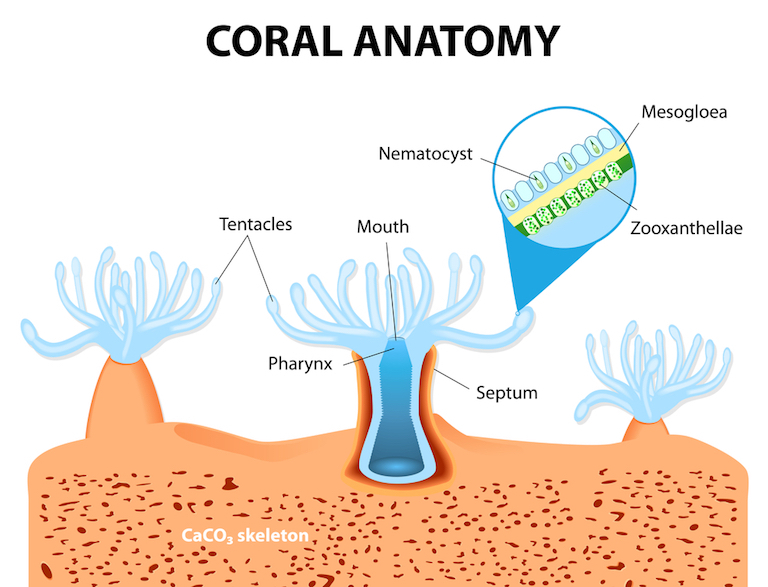 In exchange, coral supplies carbon dioxide and ammonium to zooxanthellae. This relationship, where both organisms benefit, is known as a symbiotic relationship. Above-average seawater temperatures can, however, cause these polyps to expel the algae living inside their tissues. These conditions put pressure on their relationship, restricting resources and forcing algae out of the coral. Soon, their energy source is depleted and the coral becomes bleached white and colorless, often leading to disease and death. What are the Causes of Coral Bleaching? 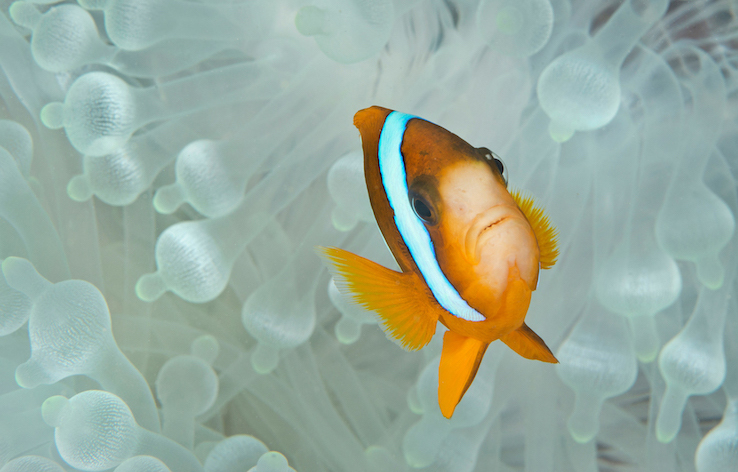 Although some are more common than others, coral bleaching can have a number of causes. The most common cause of coral bleaching, and the biggest concern among the environmental protection community, is rises in seawater temperature as a result of global warming. Changes in water heat affect zooxanthellae photosynthesis, forcing it out of coral polyps and depriving coral of essential resources. During summer months, coral bleaching can occur due to solar radiation. Both photosynthetically active radiation and UV radiation have been associated with bleaching. Low tides, sea level drops and tectonic uplift can result in sudden exposure of coral to the atmosphere. 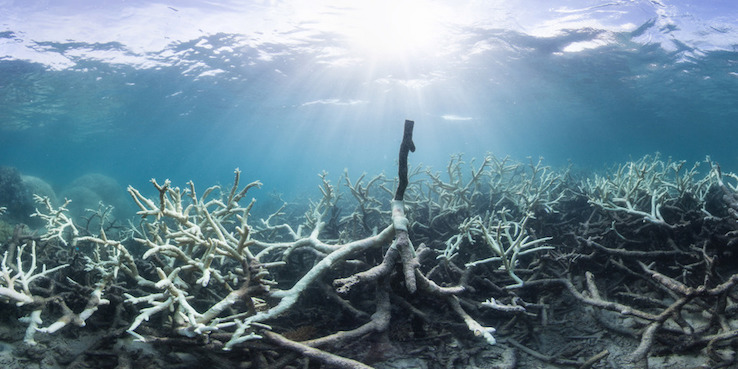 Whether due to exposure to high/low temperature, increased solar radiation or desiccation, subaerial exposure often results in bleaching and consequent coral death due to sudden changes in atmospheric conditions. Though uncommon, coral bleaching can sometimes be linked to sediment. Activities such as land clearing and coastal construction can result in high rates of erosion, increasing sediment content in water and disrupting the natural process of photosynthesis. Following intense storms or heavy rainfall, increased freshwater precipitation can cause rapid dilution, increasing water salinity. Such events, though considerably rare, can cause bleaching in small, nearshore areas. Increases in inorganic nutrients such as ammonia and nitrate do not deplete coral of zooxanthellae, but rather cause it to multiply, increasing its content by 2-3 times. 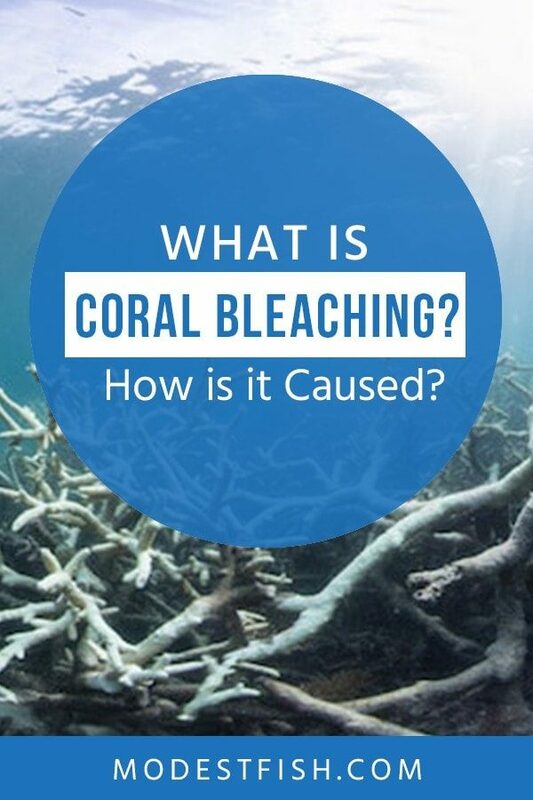 Though this does not directly cause bleaching, secondary adverse effects such as lower coral resistance and increased disease susceptibility can occur. Exposure of coral to chemical contaminants such as copper, herbicides and oils can cause zooxanthellae loss. Such loss is often highly localised, only occurring where xenobiotics (foreign substances) come into contact with coral. Epizootics are diseases that are temporarily prevalent, often becoming widespread through animal populations. What Mass Bleaching Events Have Occurred? We have lost 25-40% of the world’s corals in the last two decades due in large part to rising ocean temperatures and ocean acidification. Beginning in 1980, the Great Barrier Reef (GBR) of Australia has experienced a number of mass bleaching events over the past thirty-eight years. The most widespread and significant bleaching events of the GBR occurred during the summers of 1998 and 2002, seeing 42% and 54% of coral reefs at least partially bleached, if not totally. Since 2014, a global mass coral bleaching event has been taking place due to record ocean temperatures. These temperatures have resulted in the most severe coral bleaching the GBR has ever experienced, 2016 suffering a 29% loss in shallow water coral due to bleaching. With ocean temperatures continuing to rise, it is expected that coral bleaching will increase in severity within the GBR over coming decades. In 2017, Japanese coral reefs were reported to have loss 75% of coral populations due to bleaching. This bleaching was attributed to rises in sea temperatures due to global warming, affecting zooxanthellae relationships with coral and resulting in enormous amounts of bleaching. This is, in part, due to the El Nino global warming event which took place from 2014-2016. An El Nino is an irregularly occurring series of climate changes, resulting in a sudden and prolonged increase in water temperatures. 1997-1998 saw an enormous and tragic loss of global coral populations with the passing of one of the strongest El Ninos in history. The effects of the El Nino in 1997-1998 caused permanent damage to certain areas of the Indian Ocean, the Maldives, Sri Lanka, Kenya, Tanzania and the Seychelles experiencing a loss of 90% of coral cover. Why is Coral Bleaching So Bad? – What Impact Does it Have? Many species suffer population losses, some even experiencing total extinction. Though tragic, such events rarely cause as large a global uprising as coral bleaching has over the last few decades. So why is bleaching such a prevalent issue? This is because coral is a fundamental species in the ecosystem of our oceans. Many aquatic species depend upon coral for protection shelter and protection from predators. 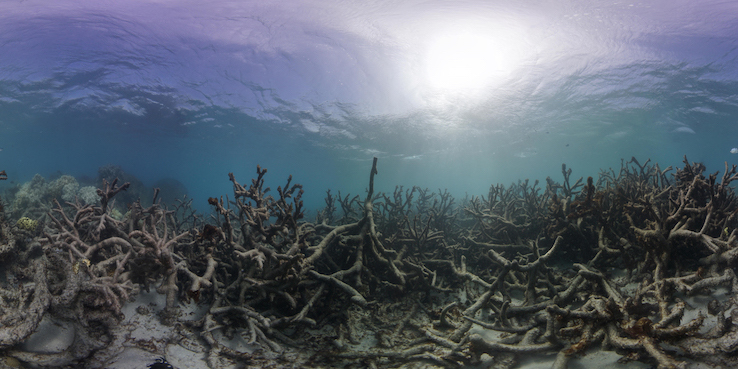 If coral populations were to drastically decrease or vanish, a domino effect would take place. Prey would lose their shelter from coral, resulting in population decline due to increased predation. This decline would affect species at the lower levels of the food chain, and so on. 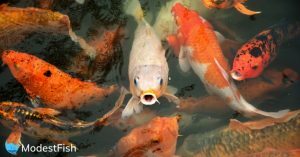 What begins as the death of a seemingly insignificant species could quickly result in a total disruption of our aquatic ecosystems. Fisheries would be depleted of their resources due to population declines in marine species and global economies would suffer greatly. In addition to this, coral reefs also act as a protective barrier against waves, storms, erosion and flooding, absorbing impact and preventing damage to coastal structures. Reduction in coral populations would be catastrophic not only to marine ecosystems, but also to shoreline properties, resulting in a total and significant economic catastrophe. Coral is vital to the health of our oceans. Without it, the global economy would, as Skoloff claims, bring about political instability, hunger and poverty. How Are Coral Reefs Adapting to Bleaching? Though coral populations have suffered significantly due to global warming in recent decades, modern studies imply that coral reefs may be able to adapt to rising sea temperatures. 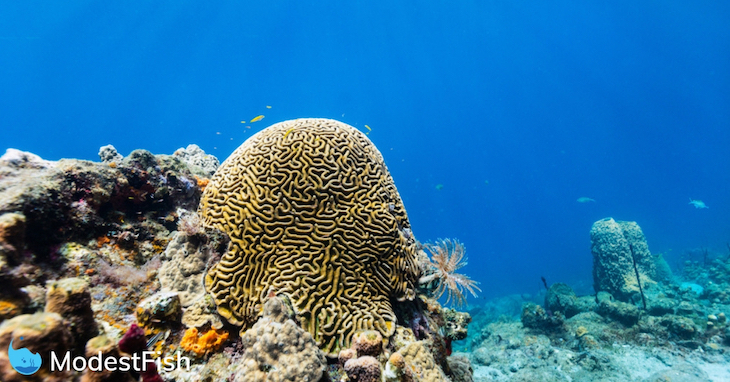 A study funded by the National Oceanic and Atmospheric Association suggests that corals may be able to adapt to thermal stress through adaptive processes like genetic adaptation, acclimatization and symbiotic shuffling. Through adaptation, coral populations may reduce the currently projected rates of temperature-induced bleaching by 20 to 80 percent of those predicted by 2100. The report suggests that future research should test the rate and limits of adaptive responses for coral species, helping to determine the effectiveness of its adaptations to thermal stress. What Can be Done About Coral Bleaching? It isn’t all doom and gloom – thankfully, the conservation of global coral populations is possible. In fact, we can both do our bit to put a stop to coral bleaching. 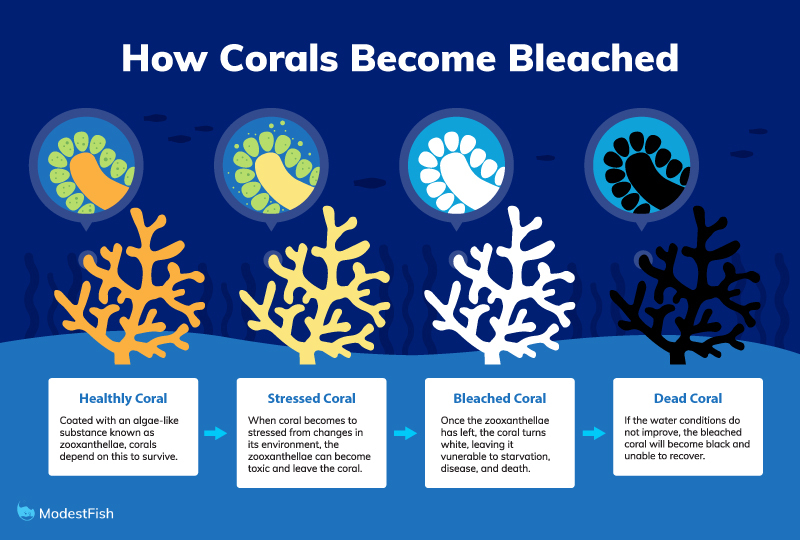 Before looking at how to put right coral bleaching, let’s look at how we can prevent it in the first place. 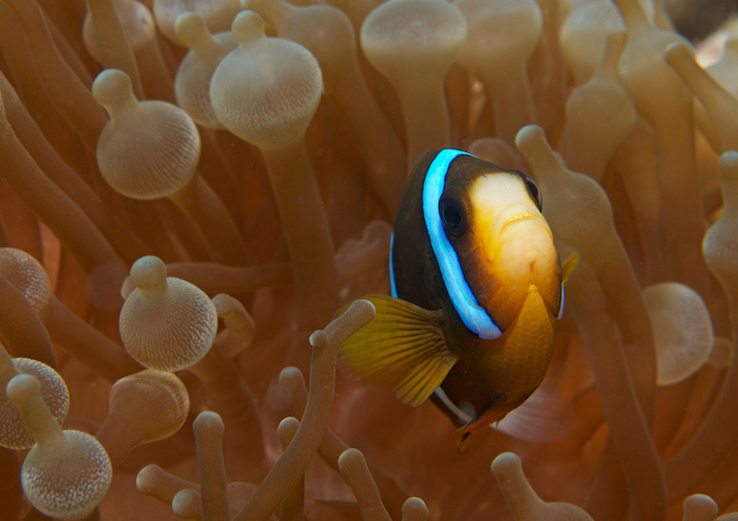 Each and every one of us can protect coral reefs by opting for sustainable seafood. Sustainable fisheries conduct their practice without damaging local ecosystems, preventing coral bleaching. 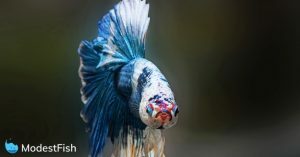 Before purchasing fish, search it up on FishWatch’s database to check its sustainability profile and avoid contributing to bleaching. Instead of leaving your taps to run when not in use, or showering for longer than necessary, simply making efforts to save water at home can help protect coral reef populations. By using less water, oceans remain cleaner and coral health at a high standard. By minimising your contributions to climate change, you help to conserve and protect global coral populations. Recycle more: When you recycle items instead of throwing them away, your waste is kept out of landfills, reducing carbon emissions and lowering your contributions to global warming. Less global warming means less coral bleaching. Use energy-efficient bulbs: Energy efficient light bulbs emit less greenhouse gasses than standard bulbs, shrinking your carbon footprint and helping prevent global warming. Eat less meat: Believe it or not, animal farming is one of the largest causes of global warming. Simply eating less meat can significantly reduce your contributions to climate change, protecting coral populations from bleaching. Walk more: Cars burn fossil fuels like petrol and diesel and convert them into harmful gasses which contribute to global warming. By walking more and driving less, you can minimise your daily emissions and help keep sea temperatures coral-friendly. While the priority is minimising existing threats to coral reefs, many conservation agencies are now working to rebuild coral reefs and nurse them towards a full recovery from the severe damage of the past three decades. Organisations such as the Coral Restoration Foundation, for example, are actively restoring coral populations by facilitating natural processes. Sometimes, branches of coral polyps can break off. If conditions are favourable, these branches are able to reattach themselves to other surfaces and reproduce, growing into new colonies. Researchers have found ways to exploit this natural process, manually fragmenting coral branches and encouraging colonisation. Once coral branches grow into colonies, coral trees are out planted in natural reefs within 6-9 months. The Coral Restoration Foundation estimates to have planted over 74,000 corals since 2012. Microfragmenting manipulates the surface area of a coral on a two dimensional plane in a laboratory. The process allows corals to grow more than 25 times faster than their normal rate. Once the reefs have grown sufficiently in size, Dr. Vaughn’s team then transplants and installs the corals in the targeted reef. If this technology grows to scale, it could rapidly restore the dwindling population of healthy coral reefs. 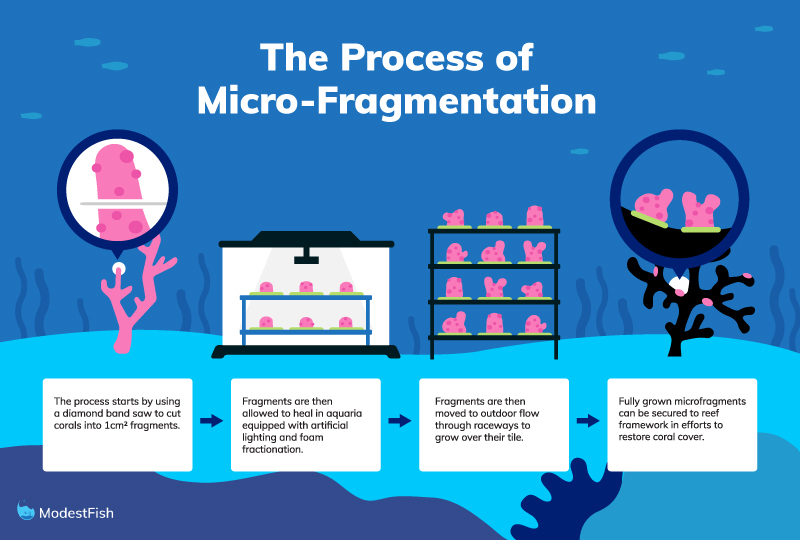 In addition to fragmentation, micro-fragmenting, a recent discovery, is also being used to repair and guard against the damage of coral bleaching. Naturally, coral takes 25-75 years to reach sexual maturity. Micro-fragmenting reduces this time frame to just 3 years. The process starts by using a diamond band saw to cut corals into 1cm² fragments. This actually stimulates the coral tissue to grow, allowing them to grow into clones at a rate 25-50 times faster than normal. A single golf ball-sized fragment can be broken down into 20 to 100 micro-fragments which grow back in just a few months. In just 6 years, 600 corals have been produced by Dr. David Vaughan’s team. This amount can now, thanks to micro-fragmenting, be produced in a single afternoon.